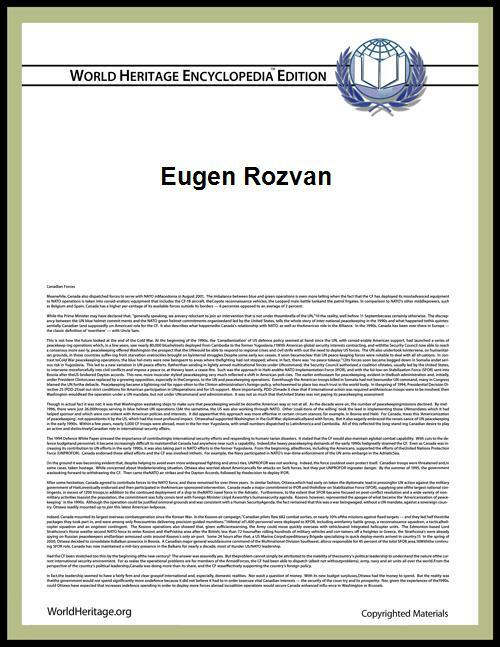 Eugen Rozvan (Hungarian-born Romanian communist activist, lawyer, and Marxist historian, who settled in the Soviet Union late in his life. He was born in Nagyvárad (Oradea). He took a special interest in developing a socialist message for the peasants, proposing a democratic distribution of the land among smallholders, as well as for the national minorities, seeking to attract Romanian rural intellectuals to the socialist movement. To this end, he joined the Romanian section of the SZDP and initiated contacts with the Romanian National Party. In 1907, Rozvan was a delegate to the Stuttgart Congress of the Second International, while in 1908 he was elected in the leadership of Bihar County party chapter. A collaborator of Ady Endre, in the latter year he became a founding member of the Tomorrow literary society, and was elected a board member of the radical Social Sciences Society. A constant contributor to the local and national socialist press, he was arrested several times on charges of offence against public order and violation of the press laws. Rozvan was drafted as a martial law. Rozvan (first from left) and the other deputies of the Peasant Workers' Bloc elected in the 1931 Romanian parliamentary elections. After the Lupeni Strike of 1929. Moving to David Fabian, Constantin Popovici, and Alexandru Dobrogeanu-Gherea. With Rozvan's agreement and the consent of other delegates, Flueraş and Iosif Jumanca were expelled following pressures from Grigory Zinoviev and Christian Rakovsky, due to their wartime support for nationalism and objections raised to Comintern guidelines. After the right-wing of party defected in early 1921, Rozvan took steps towards maintaining the party's influence among the workers of Transylvania. On May 6, 1921, he was elected president of the last regional socialist Congress for Tranyslvania and Banat, which he had helped organize, and presented the party's report on the relation with the trade union. Later that month, on May 8, he was a delegate from Braşov to the PS Congress that decided in favor of creating a Communist Party (PCdR) around the group's Bolshevik faction. For the latter congress he collaborated with Tiron Albani on preparing the report on nationalities. On this occasion, Rozvan expressed his concerns that Cristescu had maintained a "minimalist position", and the two briefly engaged in a heated polemic. Furthermore, during the debates on the agrarian question, he supported an alliance between peasants and workers in order to finalize the "bourgeois-democratic" phase of the revolution, against the opinion of Cristescu and Elek Köblös, who considered the primary target of the party should be the dictatorship of the proletariat. The matter remained unsettled, as, in the middle of the discussion, Rozvan and all the PCdR notable members were arrested, being later implicated in the Dealul Spirii Trial (in connection with the violent actions of Max Goldstein). Most of the indicted were freed on July 4, 1922, through the amnesty ordered by King Ferdinand I.
Rozvan remained active inside the Communist Party, being part of its provisional Executive Committee, entrusted with re-organizing party chapters in Transylvania. Furthermore, he became the editor of the party's Hungarian language organ in Braşov, Világosság. At the Second Congress (Ploieşti, October 1922) he drafted the reports on the national and the agrarian question. The latter reignited the debates of the founding congress, Rozvan's support of the 1921 land reform being condemned by Boris Stefanov, who considered land should be nationalized. Rozvan warned that the promotion of such ideas would alienate the peasants, however he remained a minority in the agrarian committee, and the finalization of the report was postponed for a later date. During the same congress, he was elected deputy member of its Central Committee. During the following period helped organize the party's umbrella group, the Peasant Workers' Bloc, in the region around Oradea (1926–1931). With Lucrețiu Pătrășcanu, Imre Aladar, and two others, he was elected to the Chamber of Deputies on Bloc lists (May 1931), however the mandates were nullified on government's request. It was during that time that he became critical of Comintern directives regarding the dissolution of Greater Romania, eventually coming into opposition with the PCdR leadership around Marcel Pauker, who accused him of "right-wing opportunism". In 1929, he was expelled from the party, without being notified of it, and his status remained uncertain for the following years. Rozvan decided to clarify matters by presenting his cause to Soviet authorities, and fled to Moscow by illegally crossing the Soviet-Romanian border in Bessarabia. Readmitted to the PCdR in 1934, he was employed by Eugen Varga at the Lomonosov University Institute of the World Economy and the World Politics, becoming noted as a scholar of Italian fascism (the subject of his 1937 Ph.D. thesis, which was used as a textbook). In the opinion of Vladimir Tismăneanu, Rozvan's critique of fascism also alluded to the consequences of Stalinism inside the communist movement. Rozvan became a victim of the Great Purge: arrested on December 16, 1937, denounced through the forced confessions of other prisoners, he was indicted in a kangaroo trial, and officially sentenced to ten years in prison. He was, however, executed soon after, based on an unpublicized sentence. For the following years, Rozvan's fate was the topic of investigations by Comintern leader NKVD to account for his whereabouts. During De-Stalinization in the 1950s, he was rehabilitated inside the Soviet Union; the Romanian Communist regime followed suit only a decade later, in 1968, when Nicolae Ceauşescu used the questioning of previous policies to justify his own grip on power. In 1971, a biography of Rozvan was published in Communist Romania. ^ Arvatu; "Letter and supporting materials..."
^ Arvatu; Dosarele Istoriei, p.26; "Letter and supporting materials..."
^ a b c "Letter and supporting materials..."
^ Arvatu; Dosarele Istoriei, p.27; "Letter and supporting materials..."
D. E. "Romániai magyar irodalmi lexikon I-IV. kötet (A-R)" (in Magyar). Retrieved 2007-01-28.